Why Can You Put 5 Pounds on in Two Days & It Takes Forever to Lose? It can be discouraging -- although not necessarily surprising -- to see a massive jump in the scale after a night of indulging in too much food. And while overeating can make you gain weight over weeks or months, two days' worth of overeating isn't enough to do serious damage. If you find it takes forever to lose weight, making adjustments to your lifestyle or re-evaluating your goals can help. First, the good news -- it's almost impossible to gain 5 pounds of fat in two days. Each pound of fat stores 3,500 calories, so gaining 5 pounds of fat would require eating 17,500 extra calories in two days, in addition to the calories you need to maintain your weight. For example, if you need 2,000 calories a day to maintain your weight, you'd need to eat 10,750 calories each of the two days to consume enough excess calories to gain 5 pounds of fat. That's virtually impossible to do, even if you binge on junk food. A 14-inch pepperoni pizza has 2,476 calories. You'd need to eat more than four whole pizzas each of the two days to meet your caloric intake -- and you'd still be short by about 850 calories a day. A large, fast-food burger with two patties, served with a large order of fries, has 1,060 calories. You'd need to eat more than 10 of these fast food meals on both days to get enough calories to pack on 5 pounds of fat. It's more likely that the 5-pound gain is mostly water weight. Most "junk" food is high not only in calories, but also is loaded with excess sodium in the form of table salt. Too much salt makes your body retain water, so it's not uncommon to see a jump in the scale for a day or two after you eat junk food. And although that higher number on the scale is discouraging, your body will release the excess water once you go back to a healthy diet, returning your weight to normal. However, eating high-sodium food on a regular basis has effects beyond a temporary increase in body weight. Regularly eating too much sodium may increase your chances of developing high blood pressure, and sodium actually increases calcium loss, which can potentially harm your bones. The occasional indulgence here and there is OK, but keep your regular sodium intake to fewer than 2,300 milligrams to avoid negative health effects. 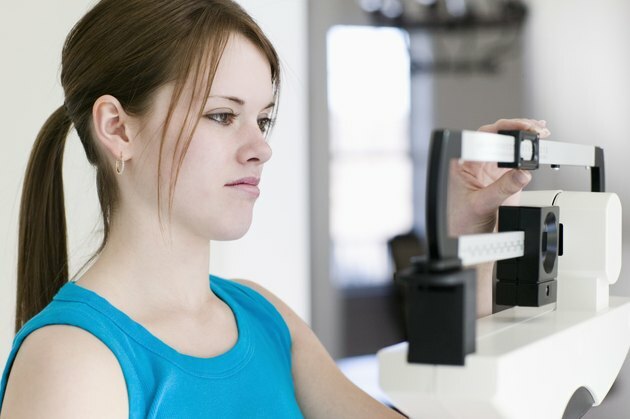 Why Weight Loss Takes "Forever"
Although the scale can shoot up seemingly overnight because of excess water, losing body fat takes a lot longer. In general, weight loss occurs at a rate of one to two pounds a week, but some people -- older, sedentary women, for example -- might lose weight even more slowly. That's a far cry from the weight loss you see on reality shows, which can go into the double digits each week. In the real world, it will take at least 2.5 weeks -- or as long as 10 weeks -- to lose 5 pounds. If you were expecting to drop five pounds a week, adjusting your expectations can prevent you from feeling as if your weight loss journey will take forever. Make sure you're also accurately recording your calorie intake for the day to ensure you're losing weight as quickly as is safely possible. One study, published in the Annals of Internal Medicine in 2006, found that people underestimate the calories in a large meal by 23 to 38 percent but more accurately estimate the calorie content of smaller meals. Weigh and measure your portions periodically to make sure you still have an accurate gauge as to what a portion looks like, and stick to several smaller meals throughout the day, since the smaller your meal, the less likely you are to underestimate its calorie count. Even if you can't actually lose 5 pounds in a few days, you can make some tweaks to help you look thinner. In addition to cutting out sodium, you should avoid other trigger foods that can cause bloating, such as carbonated drinks and fatty foods, and also avoid drinking through a straw, which may cause you to swallow air. Take a yoga or a Pilates class, or head to the gym for a weight training session. These exercises all strengthen your muscles to improve your body alignment -- and Pilates and yoga, in particular -- zero-in on postural muscles that help you sit and stand up straight. These exercises aren't calorie burners and they won't make you lose fat, but improving your alignment can help you look thinner and more confident, so you'll look better as you work toward your weight loss goals. How Long Does it Take to Get Rid of Muffin-Top Fat?